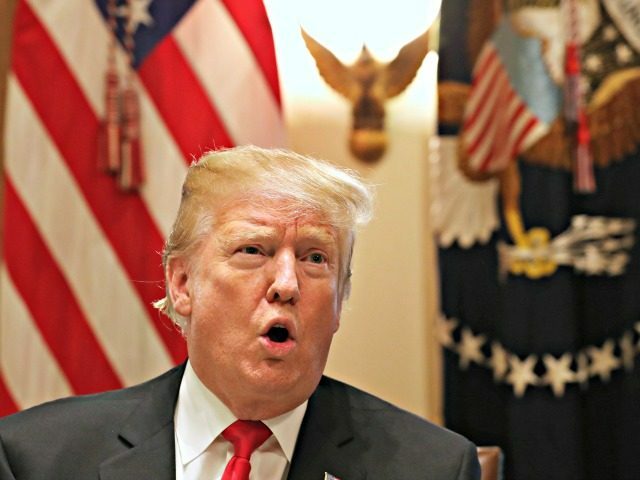 President Donald Trump said Thursday that he would consider a short-term funding bill to reopen the government, but only if he could get funding for border barriers. Trump commented on the news after the Senate failed Thursday afternoon to pass a measure to reopen the government. Both the Republican proposal and the Democrat proposal failed to meet the 60 vote threshold needed to move forward. “You need 60 … We knew they both were not going to go anywhere, we thought, and now Mitch is negotiating with Chuck Schumer and we’ll see what happens,” Trump told reporters at the White House. Trump noted that both Senate Majority Leader Mitch McConnell and Senate Minority Leader Chuck Schumer were discussing a possible short-term deal to reopen the government while talks continued. White House Press Secretary Sarah Sanders also issued a statement about Trump’s position on a short-term funding bill. “As was made clear to Senator Lindsey Graham, the three week CR would only work if there is a large down payment on the wall,” Sanders said. But the president also spoke about alternative ways to fund the wall, reasserting its importance in stopping human trafficking, illegal drugs, and illegal immigration. “We have to have a wall in this situation,” he said. The president spoke about the ongoing government shutdown during a meeting at the White House with members of Congress on trade. He thanked furloughed federal government workers as well as those working without pay. Trump said that he supported technology like sensors and drones, but only with a physical barrier. “Any technology only works with a wall,” Trump said.